Mongolian barbecue is one part myth, one part tasty and—for me at least—one part guilty pleasure. Authentic in nearly no generally accepted meaning of the word, it’s nonetheless a very popular and tasty experience that manages to ably straddle the lines between Asian fare, fast food and comfort food. But first, what is it? Mongolian barbecue is a stir-fried dish developed in Taiwanese restaurants in the 1970s. Meat and vegetables are cooked on an immense, round and ever-so-slightly convex iron griddle at temperatures of up to 570 degrees. Generally, the customer selects one or more meats (pork, beef, chicken, turkey or lamb), vegetables (onions, broccoli, peppers, mushrooms, cabbage, spinach, etc. ), sauces (soy, garlic, citrus, spicy, etc.) and Chinese-style noodles. A cook stir-fries these ingredients in front of the customer on those massive griddles. The show is part of the fun. Second, the myth: According to the nearly identical PR among most Mongolian barbecue joints, the Mongol Empire of the dim, dark past, under the leadership of Genghis Khan, ruled the plains of Asia at spear and sword-point, with soldiers returning to camp at day’s end carrying large quantities of meats they prepared and cooked on overturned shields over a large fire. There is little—scratch that, no—evidence to support this “historical” proposition. But isn’t it pretty to think so? A more reality-based name—and theory of the origin—is “Taiwanese teppanyaki.” Mongolian-barbecue restaurants began popping up in Taipei in the 1970s and appeared to use ingredients (if not techniques) similar to a genuine Mongolian tradition: hot pot. While Japan’s teppanyaki style of cooking dates back to 1945, it really gained steam in the ’70s, too. Teppanyaki is characterized by propane-heated, flat-surface grills cooking food—particularly beef—in front of guests with showy chefs entertaining with a display of elaborate knife and spatula skills. What we know as Mongolian barbecue would appear to be a confluence and combination of Mongolian hot pot with the Japanese teppanyaki style popular in Taiwan at the same time. 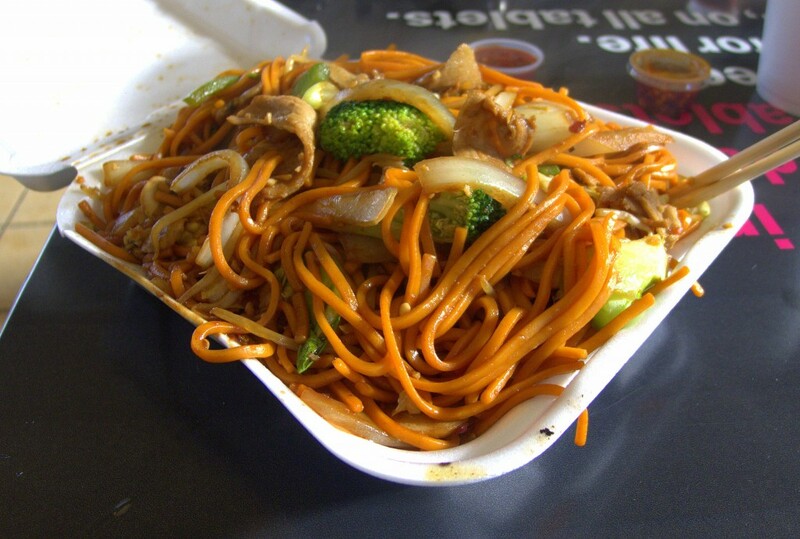 One of the best places to get Mongolian barbecue in San Diego is Great Khan’s Mongolian Festival (in Horton Plaza, Mission Valley Center and UTC, in addition to locations in Carlsbad and El Cajon). At its best, Mongolian barbecue is a terrific stir-fry, offering copious options (high mall turnover assures freshness), umami-rich sauces and good noodles all cooked to order on the monumental griddle, aided by a soy-ginger-water mixture. The resulting dish features the benefits of steaming but also caramelization from the initial sear. On numerous trips to the Horton Plaza shop, that’s exactly what I enjoyed. But a morning visit to the Mission Valley location yielded undercooked noodles, meat that was stale and bland because it was refrozen at the end of the previous day and food that wasn’t caramelized before adding the steaming liquid. It was a disappointing meal at odds with my prior experiences. One bad dish notwithstanding, Great Khan’s offers big Asian flavors, fresh ingredients and the enjoyment of the game of trying to cram as many foodstuffs into one bowl as you can. Elegant? No. Subtle? Not so much. Immensely enjoyable, gluttonous guilty-pleasure? Absolutely!